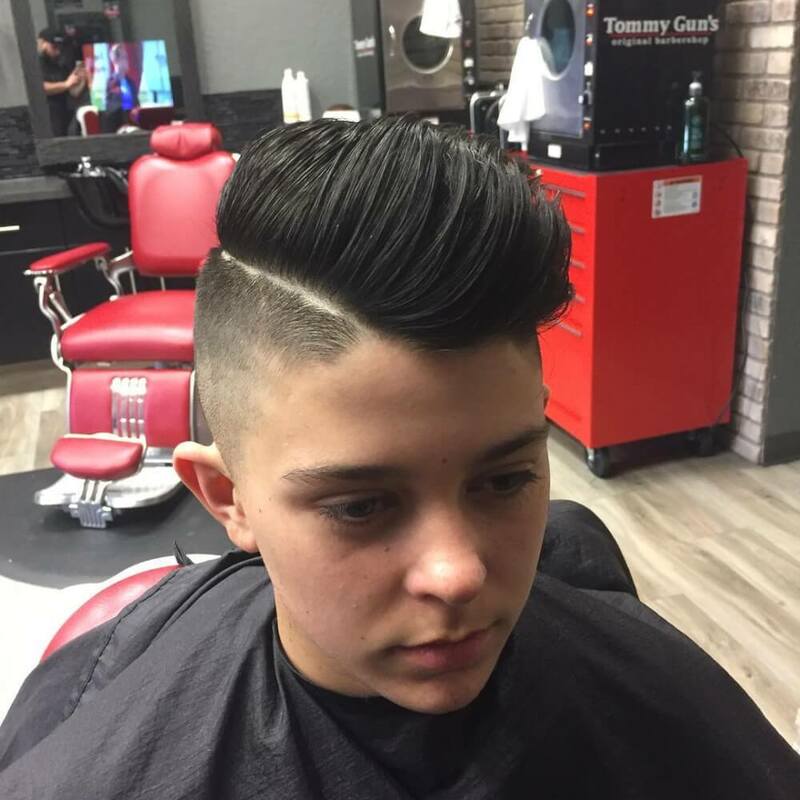 The pompadour is a hairstyle that’s considered classic throwback (think Elvis Presley) and it’s incredibly popular right now. The modern takes on this vintage style exude class and masculinity. 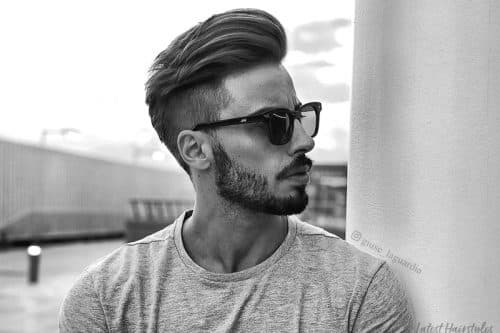 While all men’s pompadours have the same general look, there are still a variety of ways to cut and wear this style to fit both your hair texture and your personality. 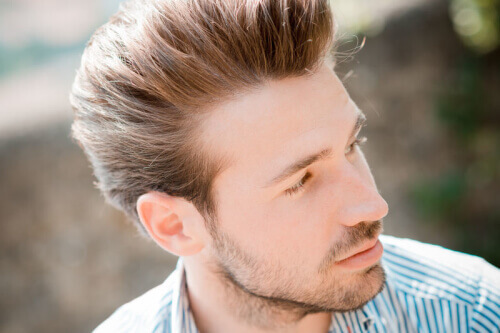 Browse our extensive collection of men’s pompadour haircuts and hairstyles to find your next look. The longer hair on top adds lots of contrast to the short back and sides. 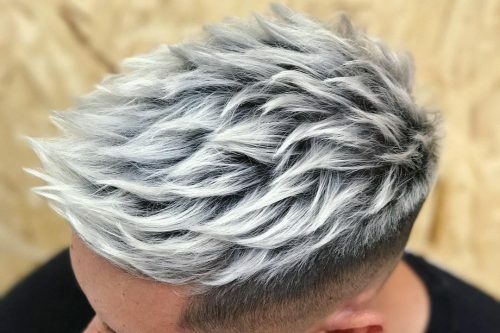 Skin faded sides, until the last possible moment hair is kept short and then ZOOM raised like a mighty mountain, unapologetic, a cut that’s definitely BOLD. Short pompadours don’t just pair with a suit and tie. This look keeps your style genteel no matter what the setting. 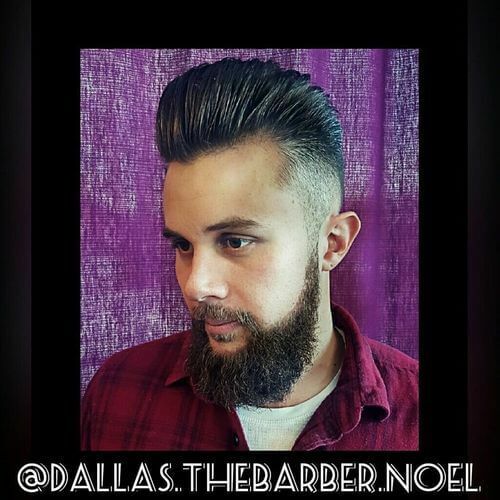 The haircut is a classic pompadour up due with a drop skin fade. 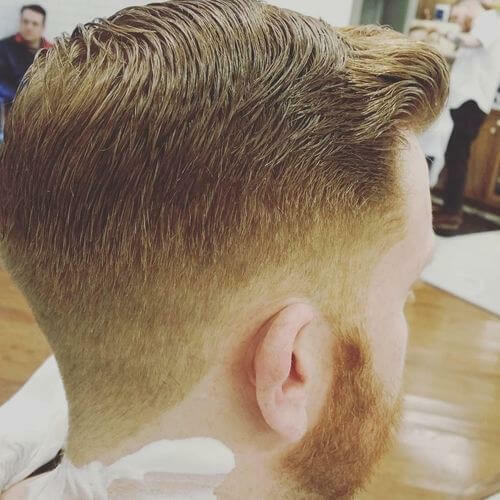 My favorite thing about this haircut is that it’s a long disconnected classic look but with a short clean fade on the side. 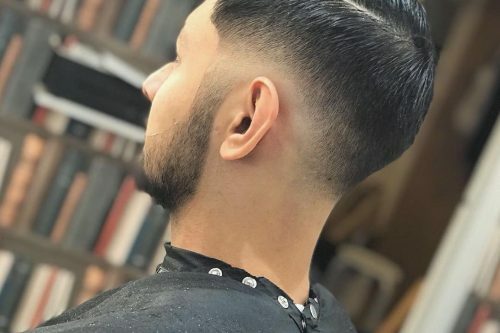 Find a knowledgeable barber/stylist who will help cut, form, and shape your hair to your desired look and also provide the right product and volume for their hair. 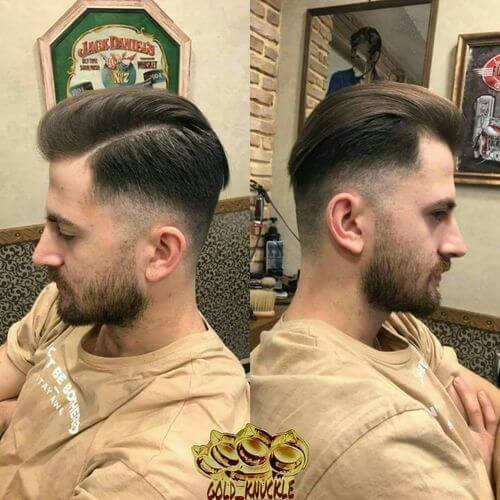 While many barbers refuse to call this a combover and instead refer to it as a “side part”, the hairstyles are really similar. The combover hairstyle consists of hair combed to one side with a part. The primary difference between the classic side part and the combover is the side-swept look and angular brush back of the hair. My favorite thing about this look is the faded sides between the hair and the beard. I give personal attention to each of my clients. If they have a long face, I advise them to keep a short and dense beard. They have to keep thick beards to make the face look less extreme. Beard scruff will only show that you can grow a lot of it! 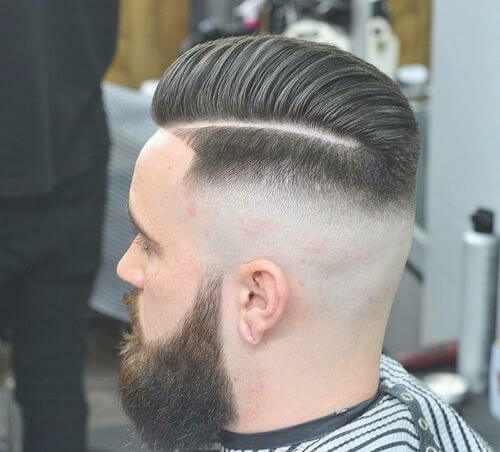 Barber in Tonbridge, Kent, U.K.
How would you describe this look and what’s your favorite thing about it? This look is cool, stylish and smart. I like the fade and the amount of volume he has. 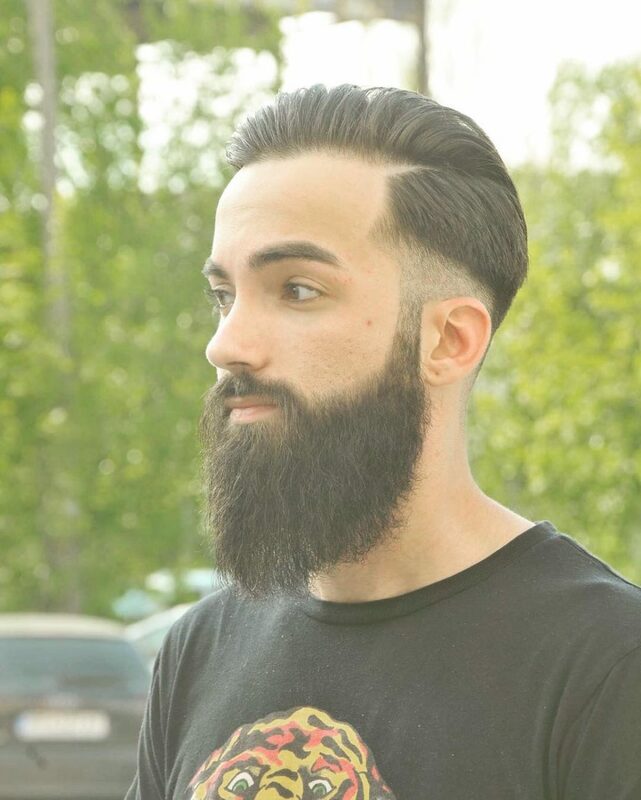 Which products would you recommend to help create and maintain this look? I recommend using a salt mist and blow drying the hair up and back to create volume. Then, use a small amount of matte clay and hairspray to finish. What type of person would this look work best for? This style suits people with straight hair or with a slight wave to the hair. Curly hair will not work for this look. It’s perfect for people with an outgoing personality. 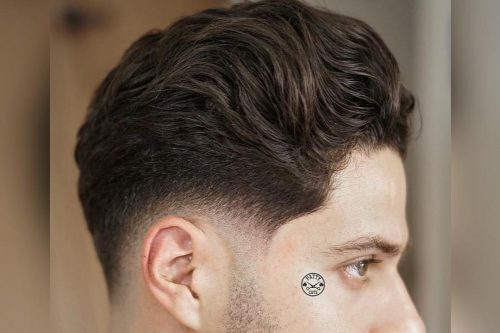 What’s your best tip for someone who’s considering this look? Make sure you blow dry your hair every day for volume. 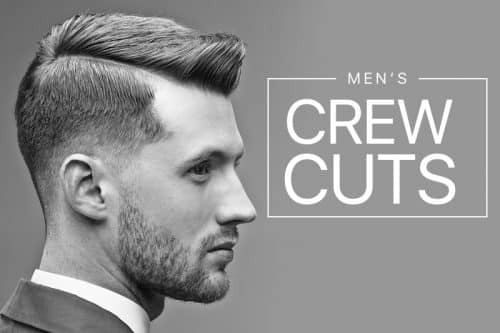 Get the cut shaped up approximately every three weeks. This is one of my favorite haircuts from the past decade. The style is reminiscent of a 20s-40s haircut but with a modern touch. Using the hair dryer to add volume and achieving the skin-fade are two steps that are key to this haircut. This really depends on the hair type, but what I would describe as essential products are forming cream, pomade and hairspray. The type of the person and his personality really doesn’t matter. What matters most is his hair type to achieve this specific hairstyle perfectly. I prefer the not so silky smooth hair with a thick scalp because the hairdryer adds a lot of volume to it even without any additional products. Basically, this hairstyle can fit a lot of face shapes and looks and that is what makes it special to me. 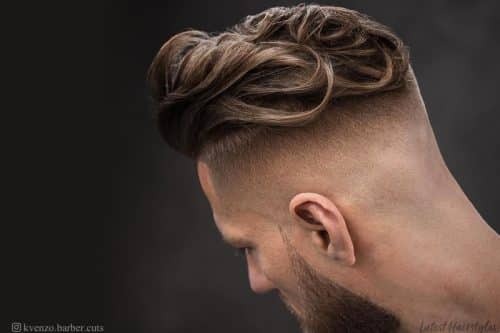 Anyone who would like to have this haircut needs to have a thick hair, a good hairdryer and some of the products that I mentioned previously to help it look clean and tidy. This haircut is a shadow taper with a textured top. 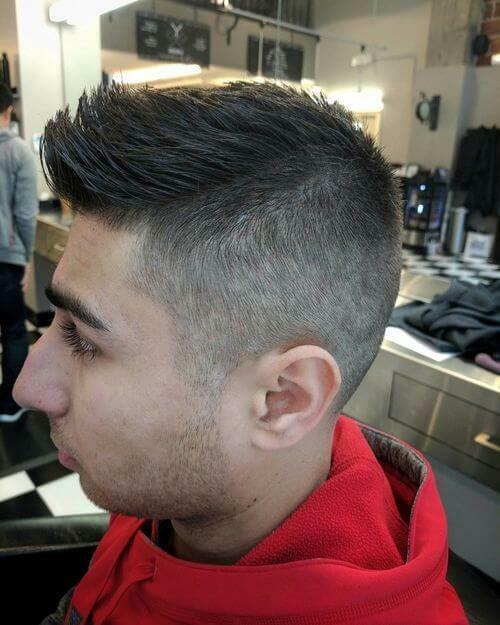 My client is military, but this cut allows him to look like a civilian too. 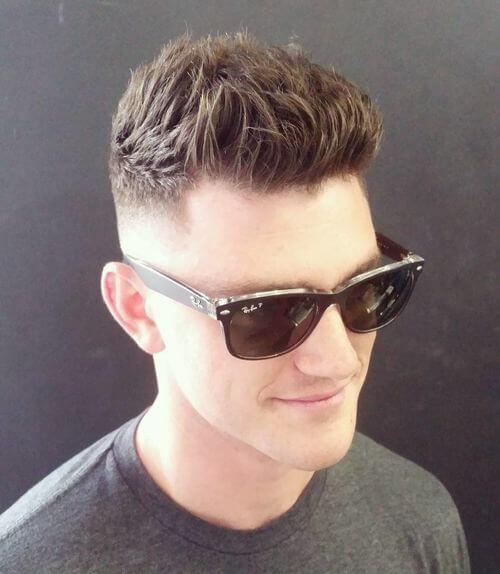 This haircut would work best for the military man who wants to look like a civilian, and civilians who want to have a clean beach look. If you have never buzzed your sides short, try it out. Hair will always grow back! How would you describe this look and what is your favorite thing about it? The pompadour was a popular haircut back in the 50s with likes of Elvis and Johnny Cash making it a popular style amongst rock and rollers. 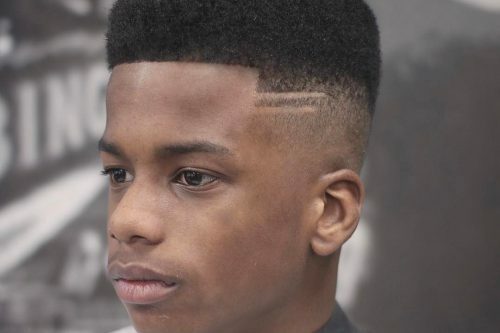 This razor fade is giving the classic haircut a modern twist. What products do you recommend to recreate this look? 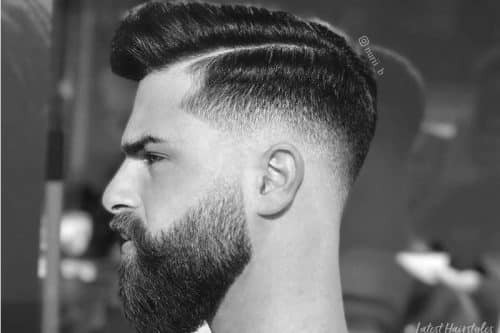 What type of client would you recommend this look for? This style suits straight to fine hair best. I think of it as a barbershop classic rock and roll/rockabilly haircut. 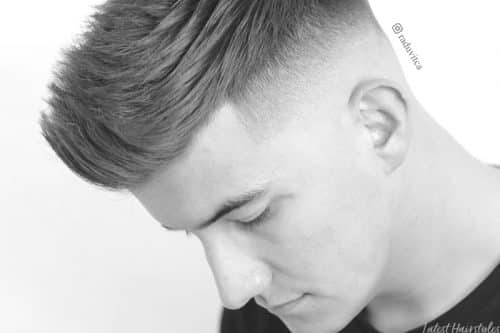 There are now a lot of variations on this classic cut that really give it a modern twist. 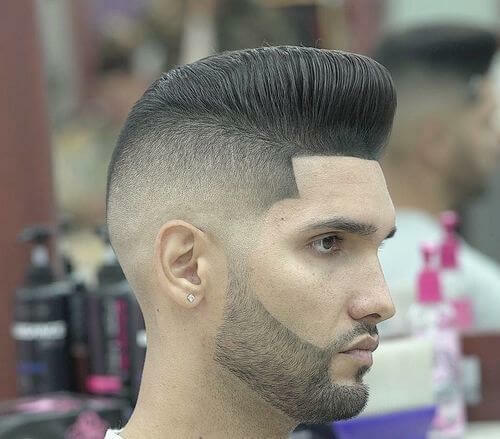 This is a men’s pompadour. My favorite thing about it is the transition between the top and the bottom. I recommend Elegance hair products. No matter what haircut you want, you have to be sure that your hair type will work with the cut you want. My advice is to dare to change your look. Change is good and can take your hair to the max! This is a classic cut with a slightly modern twist. 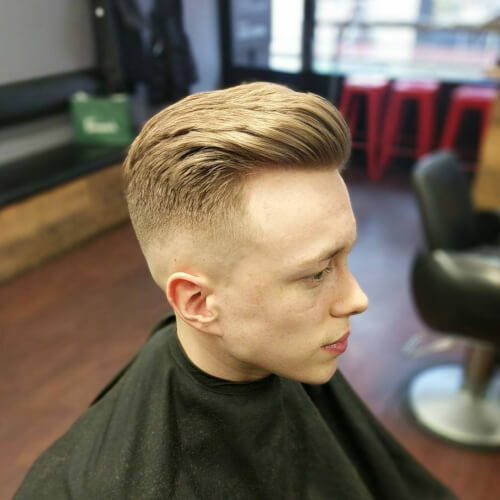 I’m always try to stick with traditional barbering techniques as the base, then I’ll try to think outside the box with styling and modern barbering techniques. 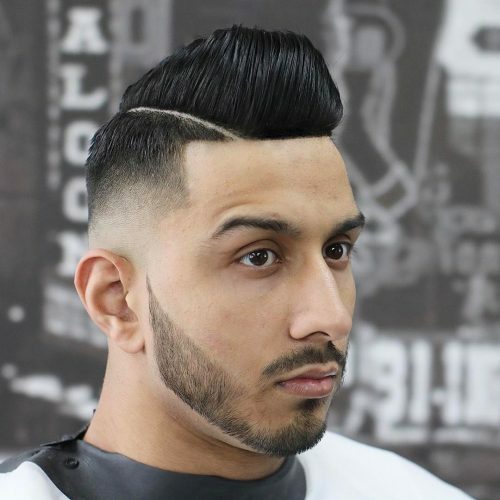 The shape of the cut is very classic and traditional while the fade and the styling gives the look that modern twist. The shape is probably my favorite thing about this look. I personally use a grooming tonic before blowdrying. Reuzel’s grooming tonic is my favorite, but I like the Suavecito one as well. 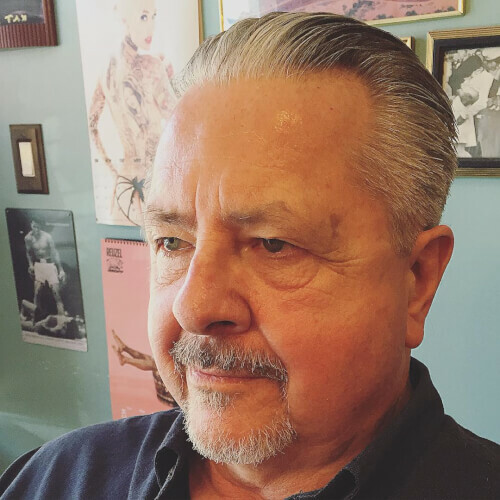 Once the hair is completely dry, I use a matte pomade like the Uppercut Deluxe Matt Pomade). The hold of this pomade is great for heavy hair as well as for men with thin hair. The model for my cut has very thick hair. I think that most hair thicknesses will work for this look, but with thick hair you can get the best shape on the sides. I would recommend this look for someone with an oval shaped face. 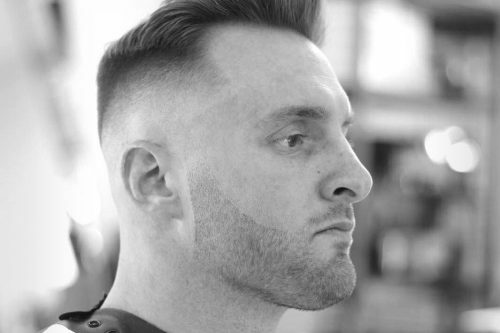 If someone has bigger forehead, this cut may give the appearance of an even bigger head. I don’t think you need to have a specific lifestyle for this cut. I’m convinced that this look will work for a fancy business man, as well as a tough construction worker. This is a gentleman’s cut with a light taper. The texture of the client’s hair is what brought the cut to life. That would be my favorite part! 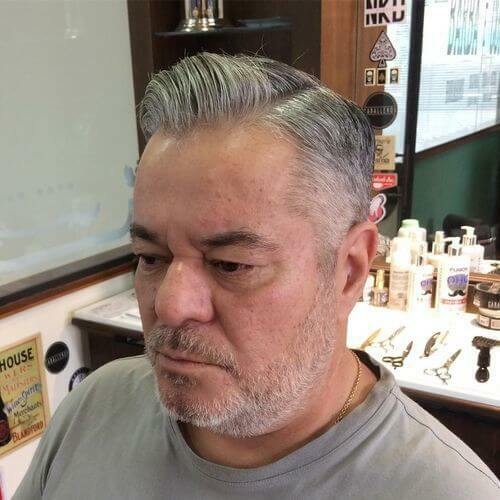 To create this look, I recommend a medium hold pomade. The look is best suited for on-the-go Millennials, individuals with profound jawlines, and oblong face shapes. 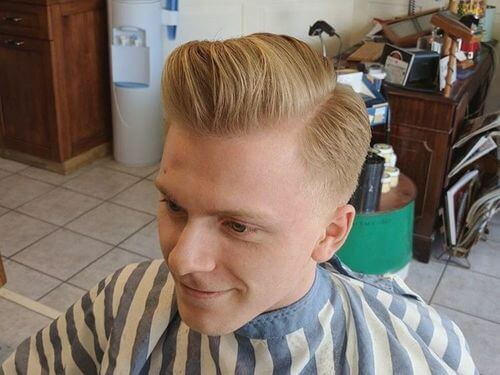 I like this look because it is the perfect example of classic barbering and the 50s rockabilly style. 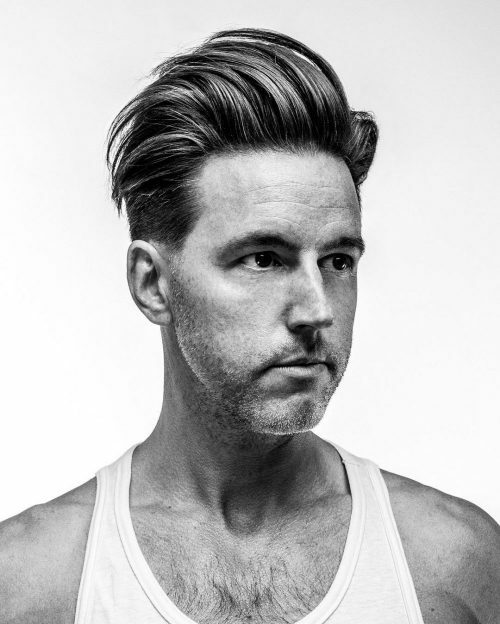 To recreate this style, I would recommend Uppercut Deluxe Matte Pomade or Sweet Georgia Brown Pomade. The blow drying is very important. You need to start from the back and then for the fringe, you have to dry the roots to stand up with tension from the brush. The best brush for this style is a Denman d3. This style is good for someone with strong hair or thick hair. Even men with curly hair, when blow dried properly, can become straight and hold its shape. 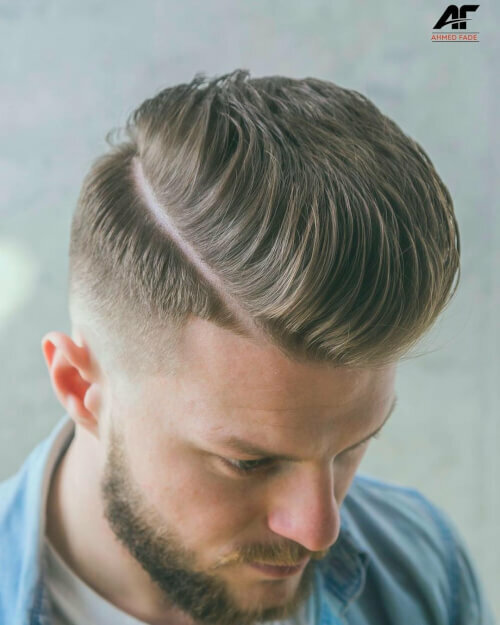 This haircut is called the “Executive Contour”. 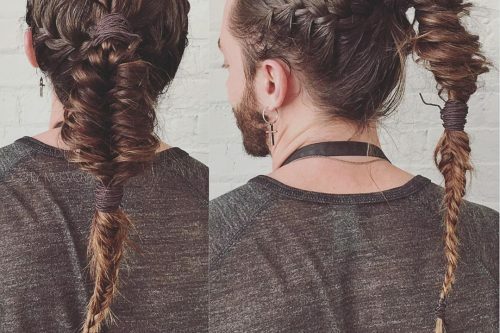 My favorite thing about it is that it can be done on the majority of hair types and be worn by men with short hair or longer hair and at any age. I recommend Layrite Grooming Spray to mold the hair (using a hair dryer) and Layrite Original Pomade to style as desired. The product used here was a Brazilian hair modeler called Caballeros. I used it as a grooming product to dry and mold the hair, and again after to style. I recommend this look for clients whose want a classic haircut and don’t have much time to spend styling the hair. The majority of my clients are doctors, lawyers, engineers and college students, but this look can match with any lifestyle from the conservative to modern. This haircut can be applied on all face shapes because its structure elongates the head silhouette. The curlier the hair, the harder it will be to style like this. I would describe this look as pure rock ‘n roll. I love the fact that it gives a lot of styling options to fit the client perfectly in terms of height and how it is connected/styled at the top and rear. This depends on the client’s hair type and preference. I like to use a strong oil pomade like the Pink Reuzel and either a touch of Green Reuzel or Grooming Tonic. If the client wants a clean head, a water soluble will work just fine if you blow dry the hair in place with the help of some grooming tonic. Anyone that has hair that is moldable (because you don’t want to fight with your hair every day) will suit this style. The cut can be easily customized to the client’s preference. 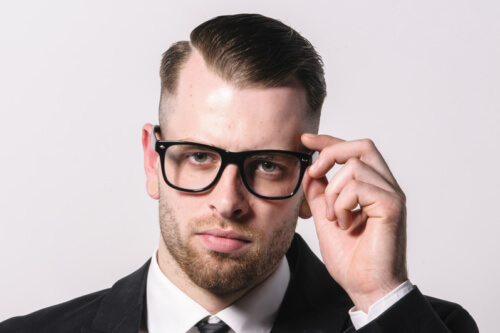 If you want that classic pomp, you want length on the sides. With a younger client, I love to go skin-faded. 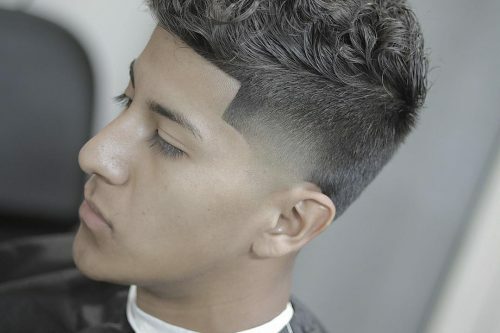 Let’s not forget that you can never go wrong with a taper either! This is an “old school” type of hairstyle. It’s hard to share my favorite thing about this look because it’s the final result with all the details that make it so great. I used two kinds of products for this look. I used a powder for volume and a pomade for hold and shine. This style is suitable for anyone that is willing to at least spend a little time styling their hair. I would describe this as a mid skin fade with a traditional pompadour and hard part. I really try and focus on the shape/shade. This look has a nice square shape with a smooth blend from skin to long hair (shade). My favorite thing would have to be his hair in general. It blends so effortlessly and it’s naturally wavy which adds a different feel and volume to this traditional style. Before product, I made sure to add lots of texture to help lift when blow drying. This can be a challenge with wavy hair. I recommend clean sections and lots of point cutting. I apply Layrite Grooming Spray evenly throughout damp hair. Then, I blow dry. A lot. I use a vent brush and continuously lift the fringe up and back until all of the hair is dry and has taken the desired shape. This takes time, so be patient and keep drying! Lastly, I apply Layrite Pomade from root to ends and comb into place with a wide tooth comb. The blow dryer makes all the difference! Honestly, I can see men/women from all walks of life rocking this style. As long as you can shape the hair to fit the shape of the head, it should work out. It doesn’t have to be a skin fade either. My client and I discussed this and decided the contrast from skin to long hair on top is wicked! In conclusion, the hairstyle is not for everyone, BUT it is for anyone who is willing to put the extra effort to style their hair. From business men to tattoo artists to janitors to teachers, it’ll work. Classic haircuts will never die. This look is my modern twist on a true rock n’ roll classic pomp. I absolutely love this look because it offers a ton of versatility as far as styling is concerned, and it’s a great way for men to get comfortable using more than just their hands to put it together. I use a styling spray while the hair is still damp, round brush to set, then finish with a mix of grooming cream and fiber by Crew to finish it off. Because this style is so versatile, it can be styled to meet almost any liking. As far as I’m concerned, anyone can wear it. It’s a style that just screams confidence so as I always say, “You have to rock the cut, don’t let the cut rock you”! This is what I’d call a classy businessman pomp. It’s a mix of classic and modern. In this day and age, time saving and convenience are almost as important as the good look itself. 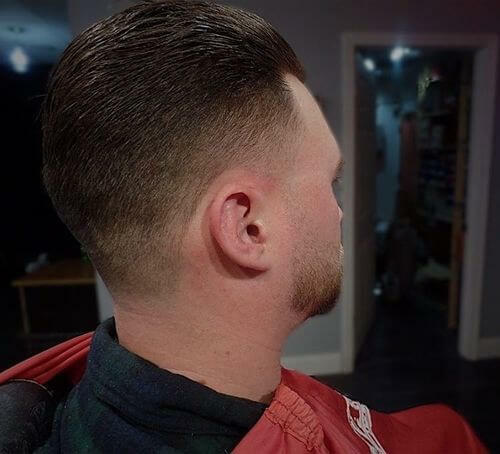 I like the length on the sides because of the fact that my client can still rock a pomp without having to have the hair on the sides too long or too short. It’s stylish, convenient, classy, smart, and modern. To recreate this look, I’d recommend a water-based pomade for a medium to strong hold and some nice shine. They are very close to traditional oil-based pomades, but are easier to wash out and, in my opinion, are suitable for all types of hair. 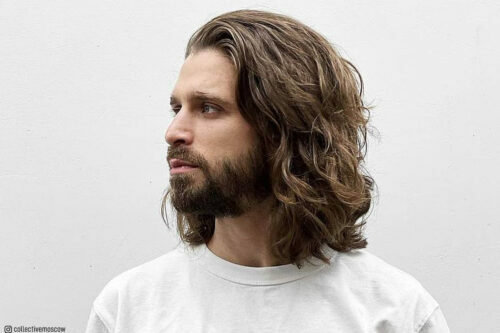 This style is achievable for almost all types of hair, although men with thick/straight or tight/curly hair would need more blow drying and have to use more product. If the proportions are kept right (length on the sides, height on the top), it would be suitable for all face types. 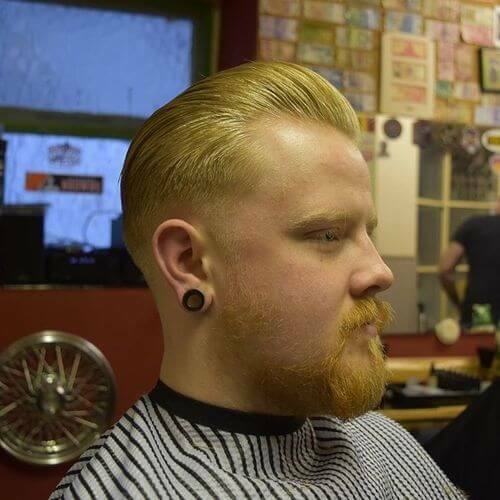 Traditional pompadours are slicked straight back, but in some cases are parted and pulled slightly to the side. Both styles focus strongly on volume toward the front of the hairline. My favorite thing about pompadours is that they’re timeless, classic, and take a certain amount of skill to cut/style! I firmly recommend Layrite Deluxe Pomade for any classic look such as a pompadour. Coming in at a close second, I use Suavecito Pomade Original Hold. A good blow dryer and quiff roller brush also come in handy! I recommend this style to any client looking for a slick. classic haircut that stands out in a crowd! Those not found of spending time combing their hair should proceed with caution. 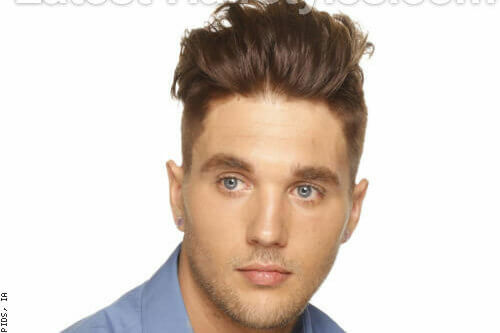 I would describe this as a fade haircut for men with a disconnected cropped top styled up into a faux hawk. I love this style because it’s versatile and can be styled multiple ways. You can comb everything forward and up in a faux hawk, comb it back for a pompadour, or over to the side for a business professional look. 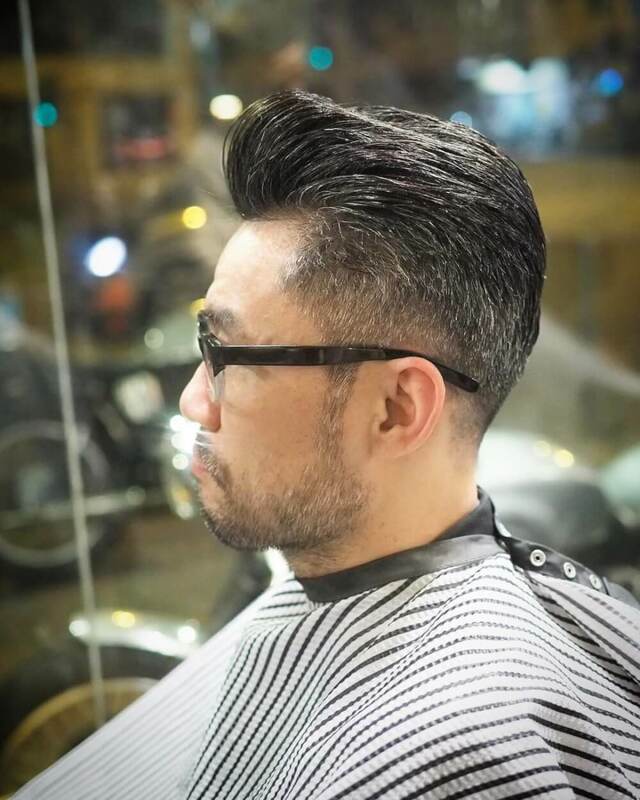 I used Imperial’s Gel Pomade for this style because it provides a very high hold with high shine. This client in particular has more difficult hair to style, so I went for the high hold. 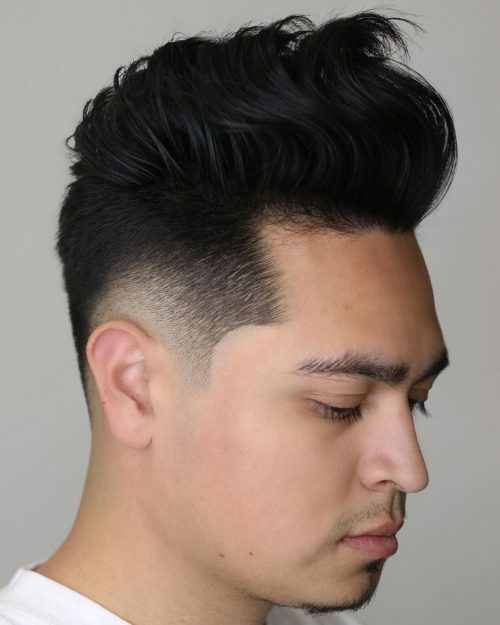 For someone with easier hair to style, I’d recommend more of a matte texture paste for a faux hawk or a high shine pomade for a pompadour or combed over look. This is one of my favorite styles because it’s suitable for any face shape or hair texture. I like it most for people who aren’t quite sure what they’re looking for because it gives them different styling options. It’s great for the guy on the go who doesn’t have all the time in the morning to blow dry and style. It’s simple yet sophisticated no matter which way they decide to wear it for the day. 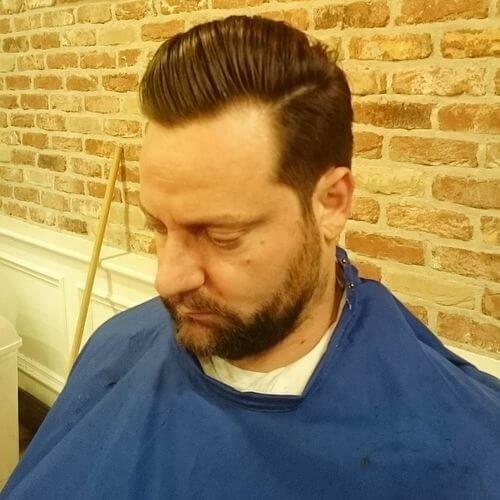 This look is a modern pompadour, sometimes known as a Scumbag Boogie. It’s a very popular style at the moment as it is smart, but very up to date. 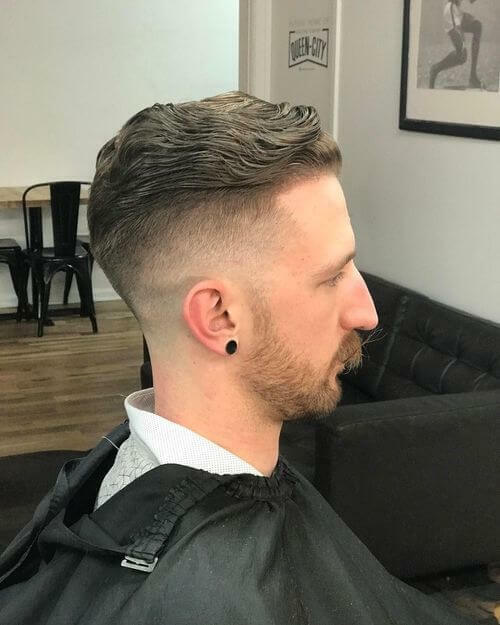 My favorite thing about this style is that it compliments both classic and modern barbering into one look with a skin fade on the sides and a classic scissor cut style on top. I used American Crew Alternator before blow drying with a Denman brush. Then I used American Crew Grooming Cream to get that classic shiny finish to the hair, followed with just a blast of hairspray to keep it all in place. If these products aren’t available to you, just look for something with high shine and heavy hold. This hairstyle really compliments everyone and can be worn a number of ways. Whether you have thin or thick hair, it’s very simple to recreate this style. 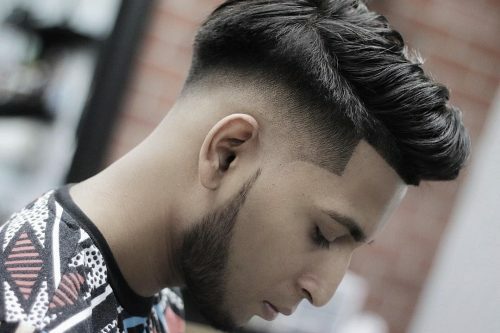 If someone has a busy lifestyle in which they don’t have time style their hair every day and still want to look smart, I wouldn’t recommend this look as it needs to be styled in order to achieve its potential as it is cut to a style. 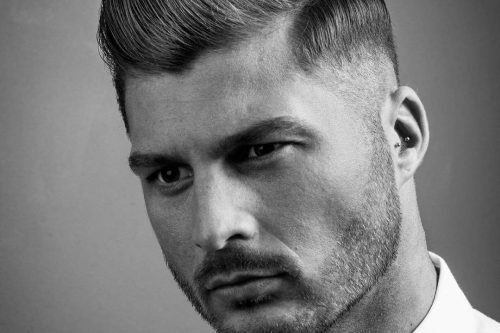 The pompadour is an always classic and always stylish hairstyle. The style has evolved since the 20s and 30s, and in the 50s, Elvis made this his signature look. 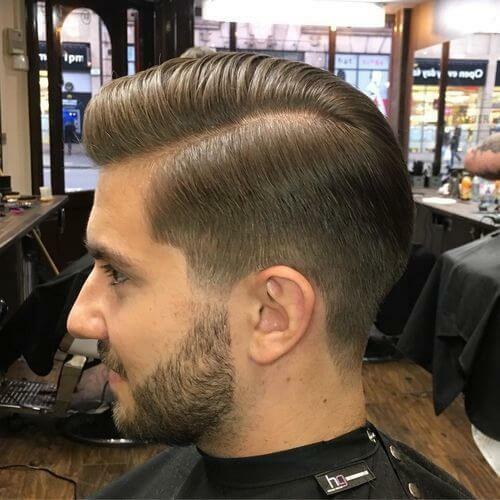 Modern takes on the pompadour, such as this one I created, take inspiration from the traditional style and give it a modern twist, experimenting with length through the top and keeping the back and sides sharp and short. My favorite thing about this style is that it can be dressed up to look sharp for a black tie event and still look good going for a coffee on a Sunday. While the hair was wet, I set the part and applied a sea salt pre-style spray (Beach Muk by Muk) before drying with a hairdryer to create the volume and lift essential to the style. 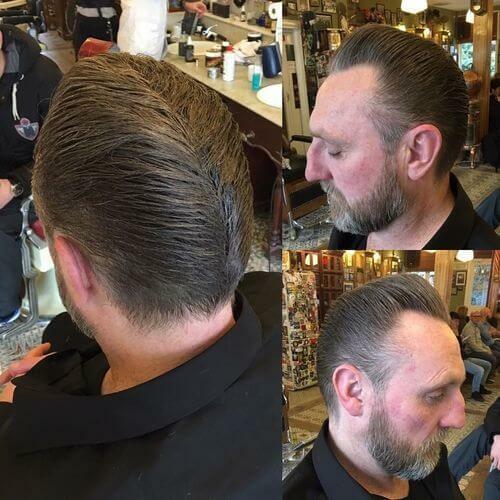 I finished the look by styling with Pomp and Co Pomade, thoroughly working it from root to tip before combing into the finished style.This product gives great hold and medium shine. The pompadour it is a classic look than can suit all ages, lifestyles and face shapes as long as it is cut correctly. It does sit best with straight hair, but can also be achieved on wavy hair with the correct styling and products. This is definitely my all time favorite cut/style to do on my clients. The main elements of this cut stay the same (i.e. the side part, the lift at the front and finish), but it can be tailored to suit a variety of clients. Regardless if you’re a businessman, hipster, celebrity or student, this look will always fit the occasion. 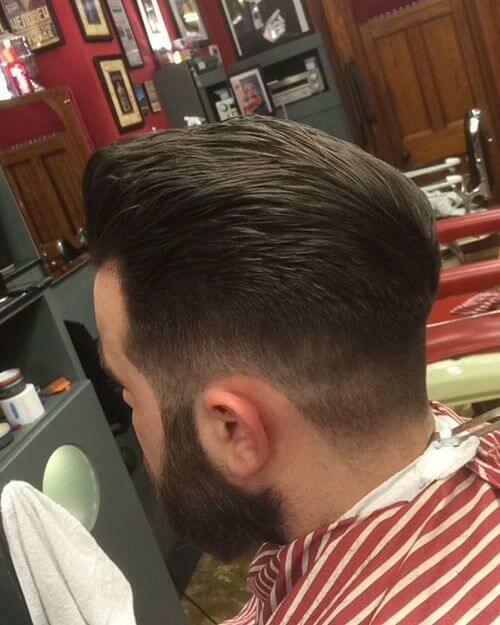 This is a classic tapered slickback. It’s cut to an executive length and utilizes the natural hair flow and growth pattern of this client. The best part of this look is its classic nature. It’s been around forever, always being slightly modified through subtleties over time. To recreate this look, we recommend a matte finish pomade. Choose something that does not have a lot of sheen, but instead looks dry and natural. 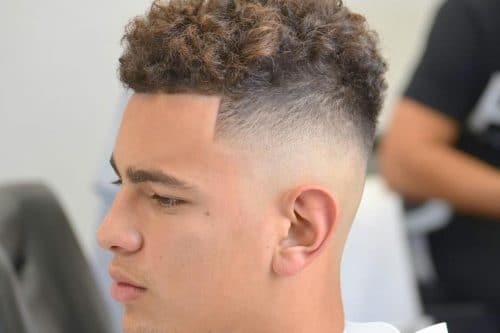 Basically this haircut would be suited for someone with a natural back-flowing growth pattern (some people’s hair naturally would prefer to go forward not back) and a fairly full top head of hair. This hairstyle is also best suited for someone that is cool with applying some product and taking a little time to create the look in the morning. We consider this a medium maintenance level hairstyle. It works for anyone hanging around the garage, the office or the bar. It’s a very versatile look! My favorite part of a pompadour is the vintage class of the style. It brings you back to the days of the 50s when hair was done every day and everyone was well dressed. If you are looking to style a larger pompadour, I recommend a blow dry product such as a salt spray or a grooming tonic. For styling, I recommend a pomade or fiber product. The pompadour is a great style for most face shape as it can be cut and styled according to your face shape. A low and slick pompadour can be styled quickly with a pomade and comb, whereas a larger pompadour should be blow dried for volume. This pompadour is very classic hairstyle. I love this look because you can match the different shape to each personality type and lifestyle. I mainly use and recommend Reuzel Red pomade. Gentlemen, rockers, teddy boys, rockabillies can all wear their version of the pompadour! A good barber will design a pompadour to flatter any face shape. I would describe this look as your classic and traditional haircut. My favorite thing about the cut is the silhouette. 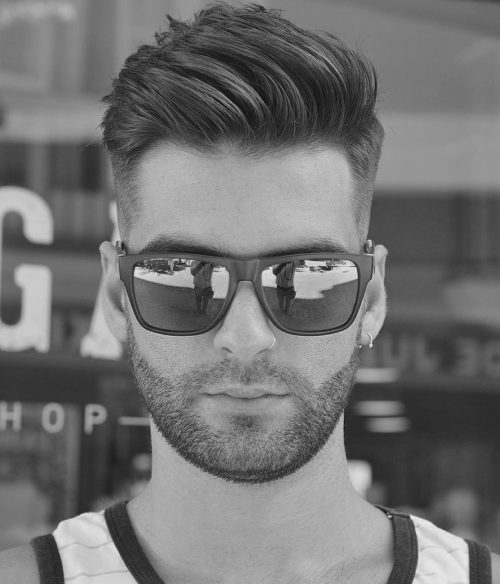 Creating the volume in the front and ending it slick in the back gives it a progressive style. What products do you recommend to maintain and recreate this look? I recommend a light gel or grooming spray to help create a base when blow drying. To finish, I would use a water-based pomade with a high hold. I recommend this haircut to the gentlemen who take time in the morning to style their hair. This isn’t for the wake up and go guys.